The unexpected calmness of Werner Herzog, 28 March 2004 Author: sleepsev (bearania@yahoo.com) from Bangkok, Thailand `Wheel of Time' is a very good film, but I admit that it is different from what I expected from Herzog. He is still very talented, but I doubt if the subject matter is best suited to him. `Wheel of Time' concerns many things, including religion, virtue, and faith, which in this case may not be the best subjects for Herzog. But when `Wheel of Time' deals with some strange and crazy rituals, political oppression, and rugged landscapes, these parts of the film are very satisfying.Some scenes in `Wheel of Time' are magical, especially the scenes which show vast landscapes and people performing strange rituals. Those scenes are Herzogian, I think. Nobody does this kind of thing better than Herzog. If a cinephile watches these scenes, not knowing who shot them, he or she will guess correctly that they were shot by Herzog. These scenes make `Wheel of Time' rise way above television documentaries.But other scenes are not as magical as I expect from Herzog's films. I think that maybe the religious subject matter of this film doesn't allow Herzog to be as playful in directing as he was in other films. It is very difficult for any filmmaker, including Herzog, to make an interesting documentary about something virtuous like this. It would be much easier to make an interesting film if the film is about `good vs. evil', or about some strange rituals in which people walk on fire and pierce themselves horrifically.I think Herzog is like a wizard, and one can hardly makes a more magical film than him if the film is about nature-made or man-made madness, brutality, or suffering in life. 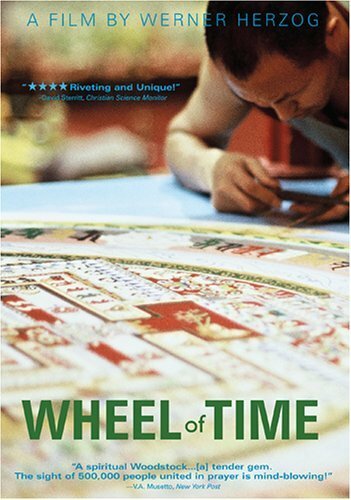 But because of the subject matter of `Wheel of Time', this film is not my most favorite of Herzog's. I like `Wheel of Time' as much as Herzog's `How Much Wood Would a Woodchuck Chuck' (1976) and `The Flying Doctors of East Africa' (1969). I think these three films are very good films, but because the people portrayed in these films are not `very' strange nor `very' crazy, these three films lack some kind of excitement I found in other films by Herzog, especially when compared to Herzog's `Gesualdo: Death for Five Voices' (1995), `My Best Fiend' (1999), `The Great Ecstasy of Woodcarver Steiner' (1974), and `Land of Silence and Darkness' (1971), which is my most favorite of Herzog's films.Some parts of Herzog's `Lessons of Darkness' (1992) deal with political madness, and I think Herzog is good at this subject, too. In one scene in `Wheel of Time', a former political prisoner gave an interview about the brutality of the Chinese rule. This scene is very simple. It is just a normal interview. But for me the power of this scene is much more stronger than most scenes in `Wheel of Time'. And it also reminds me of some great scenes in `Lessons of Darkness' in which some people gave their own testimonies to what happened when Saddam invaded Kuwait. I think one thing that makes the scene about the former prisoner stand apart from other scenes in `Wheel of Time' is because this scene talks about `evil forces', while other scenes in `Wheel of Time' are about some kind of virtuous power.